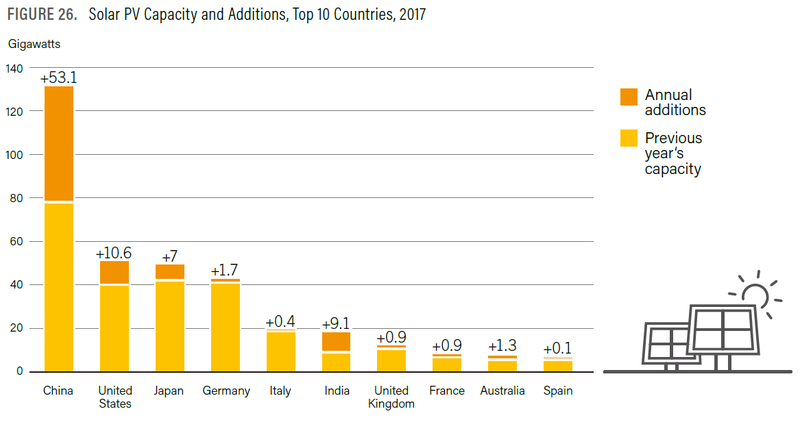 Of course, China isn’t the first country to slash subsidies for renewable energy, but they are in a different position than developed countries like Germany and Spain, where power demand was relatively stable and renewables were helping to replace power derived from fossil fuels and nuclear power. China’s energy consumption, on the other hand, is growing rapidly. As a result, the country has had an aggressive “all of the above” energy strategy. China has added solar photovoltaic (PV) capacity faster than any other energy source and has done so at a rate faster than any other major country. A primary motivation for its solar PV investments is China’s need to rein in pollution. But China also knows it faces a future in which oil supplies are depleting while electric vehicles are proliferating. Thus, China sees renewables – and solar PV in particular – as a critical area of focus. Related: Is Russia Bailing On The OPEC Deal? Given China’s growing need for clean power, China’s decision to curb subsidies caught many — including me — by surprise. Why would China make such a decision? Converting fossil fuels into electricity to be stored in a carbon intensive lithium battery with no economical way to properly dispose of the battery, has a larger adverse environmental impact than burning gasoline in a combustion engine. How is that we jumped from horseback to flying to the moon and back and yet now, 50 years later, everything is essentially the same and we never returned to the moon. Is not the moon thought to hold valuable minerals? Same goes for medicine and the general quality of life of the human race. Life expectancy on the decline, average intelligence declining.